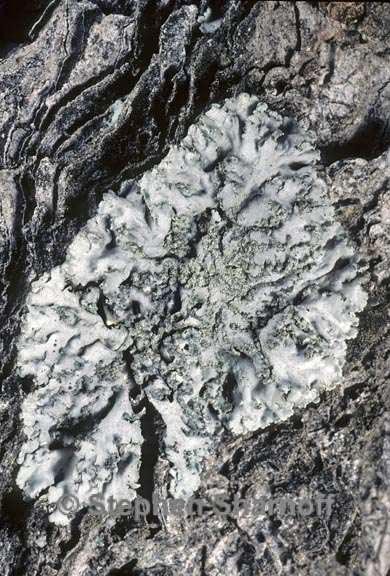 Thallus: irregular, sometimes orbicular, up to 3 cm diam., with ± imbricate lobes lobes: up to 3 mm wide but usually narrower, crenulate at tips with minute lobules, eciliate upper surface: brownish gray to gray or cream colored, with a ± prominent pruina (crystals), sorediate soredia: granular, in marginal soralia, less frequent on outer lobes upper cortex: paraplectenchymatous medulla: white lower cortex: prosoplectenchymatous lower surface: whitish to brownish, with pale gray to brownish rhizines Apothecia: rare, not seen in Sonoran material, elsewhere up to 2 mm diam. ; disc: white-pruinose ascospores: brown, 1-septate, Physcia-type, 17-23 x 8-12 µm Pycnidia: rare (not seen) Spot tests: upper cortex K+ yellow, C-, KC-, P+ yellow; medulla K-, C-, KC-, P- Secondary metabolite: upper cortex with atranorin. Substrate and ecology: mainly growing on north exposed rocks World distribution: known from Europe, East Africa, South America and SW North America Sonoran distribution: a relatively common species from low to intermediate localities in Arizona, southern California, Baja California, Baja California Sur, Chihuahua and Sonora. Notes: Physcia dimidiata is the sorediate counterpart of P. biziana with a similar dull gray upper surface. Like P. biziana it has a variable cover of the pruina, but seems to be more often densely pruinose. As the pruina consists of calcium oxalate this may be explained by a greater calcium uptake from a more calcium rich substrate.